Guess who's coming to dinner (in early July)? Phoebe is finally going to be a big sister! 10/31 It's sinking in (see the last sentence of this paragraph). So far I've only told a couple people; my sister, my Bishop, one of my best friends (Mike) & my boss. Abi has always been the first person I've told (I have a call out to my brother but haven't reached him yet), Mike's wife works out with Emily & figured it out, I didn't want her to have to keep it a secret from him or I would have waited a little longer (like I will for my other friends - sorry, if your wife worked out with Emily you'd prolly have known sooner too) and both my Bishop & my boss for the same reason (as each other): Emily isn't the only one that gets mood swings when she is pregnant - good for them to know I'm not going crazy, I'm just going crazy. The backstory: We've been trying for a couple months now (mainly Emily, but I haven't been impeding her efforts) but a few things have been getting in the way. A couple months ago we had a kidney stone scare (either not a stone or it passed way easier than any I've ever had before) & we've had lousy timing with colds & sever allergies lately. 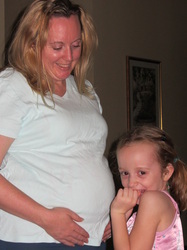 With both Hannah & Phoebe, I knew before Emily did that she was pregnant, this time she knew a couple days before I did. I only found out on 10/28, though I had my suspicions a day or two earlier. At this point we're not officially telling friends & family; Hannah and Phoebe don't know, though we dropped a few hints & I've been assessing their desire to have another sibling - they both want a sibling & neither has much of a preference brother versus sister, except Phoebe would slightly prefer a brother so they always have a boy when they play 'mom and dad'. 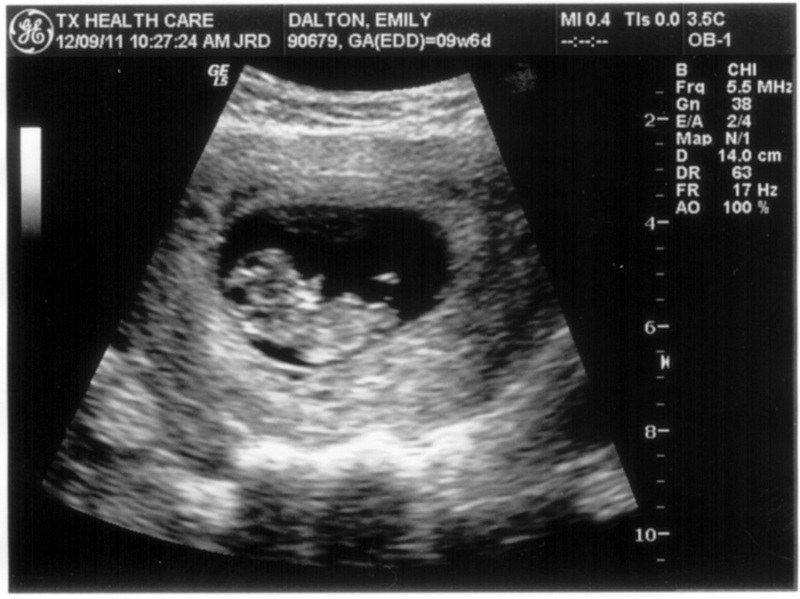 We're only at about 5 weeks, so we're waiting until a) we're out of the woods, b) Emily can't hide it anymore or c) we can't stand to wait any longer. Even though it will be some time before anyone actually reads this, I've decided to start writing it now as recollections cloud over time. 10/29 (not really working backwards, these are my recollections recorded on 10/31) Today was the ward Halloween party. I managed to convince Emily to forego her typical boring Witch costume this year and go as a pregnant woman. We used the girls' jump ball, partially deflated & duct-taped under a maternity top. I figure this will be the only time she ever gets to pretend to be pregnant for Halloween while actually being pregnant. 11/1 I told my brother last night. I made a couple subtle allusions before working a reference to having '2 or 3 kids' into conversation. Was nice to have something to share with him as we haven't talked much lately. Hopefully he'll be able to visit next fall to meet his newest niece/nephew. Was difficult to not tell Jeff last night as we carpooled home together, as it was with Brant when we went hometeaching together Sunday. This morning I woke with a really sore throat, so will likely be easy to not tell anyone as I plan to avoid talking to people as much as possible today. Apparently the company I work for was sold yesterday (mirror). Considering it was purchased for almost 7 times the expected 2011 Ebitda (according to the story, I have no [and would not share if I did] insider information) and we're already the largest in the industry (by a lot), I can only hope they are interested in the long-term. This was not the first story about the sale (mirror). 11/2 We're trying to figure out when & how to tell the kids. I was easier w/ Phoebe as Hannah was only about 9mos old herself when we found out. The cradle we used for both girls is in UT; it belongs to Emily's parents who loaned it to their kids as needed. I plan to build one, so if you have seen one that was particularly cool in some way, let me know! I also need to build a new changing table & I'd like a rocking chair for the nursery ... not sure I am up to the task of building one, though. PS: I tried to add pictures of Emily from the Ward Halloween party, but alas, I didn't get any ... if you happen to have taken her picture, please let me know right away! Boy Girl 2 Boys 2 Girls 1 Boy and 1 Girl Think "Octomom"
11/3 Dropped some pretty heavy hints on the girls tonight, referring to two people sitting on the couch when it was just Emily there, etc. Emily is convinced Hannah has already figured it out, or at the very least, will not be surprised when we tell them this weekend. I think the latter is likely correct. Phoebe, on the other hand, is oblivious. She will be excited, but surprised. Almost told my grandma today, letting the news be a birthday present of sorts (she is 93 today), but decided against it. She is old enough that she can't really be expected to keep secrets any more unless she simply forgets herself & we aren't quite ready to tell everyone yet. So, I simply told her I was anticipating some exciting news in the next couple weeks & that I would be calling her again then. Emily, wasting no time, is already starting to show. I can't get over the difference between yesterday and today. 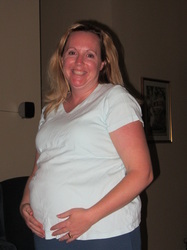 This is pretty typical for her & if things go as they usually do, she will appear 4 mos pregnant by Thanksgiving. 11/4 I never finished the picture frames for our family photos; as a placeholder for the photo of our whole family I used a stick-figure drawing (the same size as the print). Late last night (well after the kids went to bed) I started to draw a baby in the picture, but Emily insisted that Hannah would notice first thing this morning. Skeptical, but not wanting to chance it, I drew a basket instead (between Emily and myself in the picture). Phoebe was the last one up this morning, when she came out to the livingroom within 2 minutes she asked me when I drew the basket in the picture & what it was for! I told her "maybe we were going on a picnic," she immediately asked where the blanket was, that without a blanket she didn't think so! Perhaps I underestimated her yesterday! We plan to tell them tomorrow as this weekend is Stake Conference (so they won't have Primary on Sunday and opportunities to tell their friends at Church who's parents don't yet know). We still haven't decided exactly how; I was going to just drop more hints, but Emily wants to do something more creative. We'll see what she comes up with! 11/5 We told the kids tonight & videotaped it in 1080p. When I get a chance to watch it again taking notes, I'll add some specific highlight times soon (both girls made some pretty funny statements). The entire video is about 10 minutes (and at 1080p, its about 2.5GB & took forever to upload!). 11/6 Emily let Phoebe tell her parents over the phone today. Both girls are really excited! Stella (our "adopted" little sister of Phoebe and Hannah) came over today. Was really nice to see her and Jaime. 8:01 Hannah asks "Is it an egg yet?" 9:13 Phoebe realizes she doesn't want a baby brother/sister - The reason? Noise pollution! Not really baby-related (other than she's currently the baby of the family), but Phoebe gave the Family Home Evening lesson tonight on Temple Sealings. Emily and I were really impressed with how well she did (no help with her lesson whatsoever other than us asking her questions to give her more to talk about). She has obviously been paying attention! 11/8 Last Thursday (11/3) I contacted Steve at Wood Working for Mere Mortals to see if he had ever built a crib, to see if he had any recommendations. He responded quickly with some suggestions for looking for inspirations, but had not made one himself. I think I want to build it with Paul (Stella's dad), but since his wife is expecting any day now, we'll have to wait until closer to Christmas time. 11/9 We got cards from Abi, Alex & Anderson yesterday - the girls loved their cousin-made cards! Dairy sensitivity has started, I overheard Emily questioning herself as to why she had a bowl of cereal ... Good times. Hannah had a hard day today; we'll get a happy picture of her with Emily soon. I made a wonderful discovery today! Apparently, the Ramon nut (yeah, I never heard of it before either) tastes a lot like coffee when roasted. Teeccino is basically an herbal tea that tastes like a really smooth coffee. Add a dash of Stevia and a splash of milk ... Heaven! 11/16 Ok, it's official, I'm going to stop beating myself up about not posting every day ... there are some days that nothing baby-related happened & that's the purpose of this page. General updates: Emily is definitely experiencing her version of morning-sickness ... for her it is usually evening sickness, but lately it has been morning-noon-night sickness. Hopefully this passes soon. A friend of hers got her some beef jerky (didn't catch who) and that seems to be helping a little ... I told my mother & our next-door neighbours yesterday (11/15), by now it has become fairly common knowledge (although I have not told my grandmother yet and our friends that are joining us for Thanksgiving from Colorado don't yet know; Emily wants it to be a surprise for them when they get here & doesn't want to risk them thinking they should cancel the trip). If you recall 10/31's backstory (or simply scroll up, we've hit "b"). Pictures below, baby healthy & growing well - they adjusted the due date based on size from 7/7 to 7/3. Looks like we'll be missing the 4th of July party this year. Given so early in the month, we may be seeing a June baby, which would be ok with me as we don't have any June birthdays currently - if June 28th, the baby will share Bea's 1/2 birthday - that would be fun! Not sure why the tech labeled the third pic, I mean, what else would it be?! UPDATE: Next ultrasound is 19 January, we expect to learn the gender of the baby then. 12/18 Stella, Paul & Jaime came over for dinner last Friday. Not specifically baby-related, but on my mind. We mentioned to them that I was giving a talk on Faith on Sunday and invited them to join us. They weren't able to make it, but asked for a preview of the talk. I very much regret that I did not share it with them at the time. It feels weird to share a talk before delivering it, but I should have gotten past that. I know they'll read this, so I'm offering a public apology (as well as a copy below of my notes from the talk). I used my new Kindle Fire as a teleprompter, so the talk is a slideshow that I could swipe to change pages. Regarding said talk, it went over really well. Traditionally, the first talk I give in a new ward has been a much shorter version of my conversion story in it. For some reason, I did not feel like I was supposed to share it the last time I spoke (the first time in this ward). Because of this, most of my ward family had never heard the story so I felt it was finally time and this was the least abridged version I have so far shared publicly. My story is too long to paste here, but I've attached another file below that is a PDF of just the story. 12/19 It's official, American Securities purchased Global Tel*Link from Veritas. Your guess is as good as mine as to what this means. 12/21 I updated the family blog for the second time to link to this page. Unlike this page which uses a non-linked page for 'security,' the family blog is password protected - if you do not have access, let us know. Phoebe's school play was tonight. This year's kindergarten class did Wide Mouthed Frog; a musical about a frog that talks too much. No, surprisingly enough Phoebe wasn't the frog :) Phoebe was an adorable elephant! 2/10 Yet another has-nothing-to-do-with-the-baby update. During this time I have thrice battled unemployment in two different soft job markets, buried my father and my second child lost (and then regained only some of) her hearing - yet at the end of the day, I have been very blessed. 2/17 - Emily and I decided this would be the year to finally install a swingset for the kids. 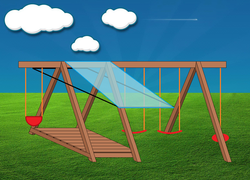 After pricing both wood and metal sets, we decided the only pre-fab sets we could afford were metal, but no metal set we could find would support large-children / adults (and while the girls aren't very big now, they will be before we know it). So, we decided to look into building our own out of wood, using the same budget & plans of our own design, based loosely on what is out there now. We have gone through several iterations and are currently planning to build a reasonable facsimile of the rendering pictured. Dimensions are 7' tall by 7' deep, width on ground is 10' and width of beam in air 16' - I'll post completed pictures with the kids playing on it here eventually, but you can follow the building on my Woodworking Log. 2/18 - Hannah & Phoebe have been using the dresser that was handed down to Emily, that her sister used before her (and may well be over 50 years old). It has 3 small-ish drawers - too small for their clothes. Because of being regularly over-loaded, the bottoms have bowed to the point they are now falling out. I'll repair the dresser, but not put it back into use as the only dresser for two clothes-loving girls; instead I'll build a dresser large enough to accommodate them hopefully at least through their teenage years. Since it has been raining non-stop & I had originally planned to start building the swingset today, Emily suggested I start the dresser first. Like all of my projects, it started out smaller & grew ... The final dimensions are approximately 48" tall by 20" deep by 62" wide in two columns of 6 drawers each. The top may or may not be attached with hinges to reveal a small (3-4") space for documents, etc. To follow this project, please see my Woodworking Log. 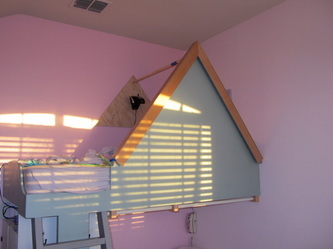 3/20 - Swingset is done & dresser is usable (it isn't pretty yet - I need to make knobs before I can do more, follow link for pictures & more details). Emily put their clothes in it today & loved that she still had 4 empty drawers and the others still had plenty of room! Upcoming projects include: crib (just wait until you read about my plan for that! ), hardwood flooring for the office (really, really nice real hardwood flooring! ), and a 'TV Window' (on the wall between the livingroom and master bedroom with the TV on a Lazy Susan so it can be watched in either room!). I also completed the fascia and faux roof on the girls' bed (pictures to follow). 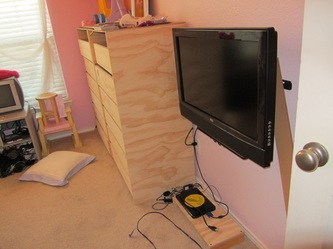 Yes, the girls to have a big screen tv now ... it takes up less room than their old CRT & it was a spare. It also hooks up nicely to their laptop - Hannah loves reading eBooks on it! 5-29 - Most of my family takes an occasional look at this page, but one person notably does not: My grandmother. Unfortunately, she is also very hard of hearing and lately it has been difficult to share with her over the phone. Big brother to the rescue, he recommended writing her an actual physical letter (something I cannot remember the last time I did). The letter was a synopsis of what is going on these days + some new pictures I haven't yet uploaded to either this page or the family blog, so feel free to download a PDF (below).